Bangkok/New York, 12 January 2000 — The international relief organization Médecins Sans Frontières (MSF) today called on the US administration to take concrete steps to begin implementing the new widely publicized policy on life-saving AIDS drugs. This policy was first announced by President Clinton in Seattle and further discussed by Vice President Gore this week at the Security Council meeting on AIDS in Africa. At the Security Council, Vice President Gore said “the United States is profoundly moved by the toll AIDS takes in Africa.” He stressed the importance of HIV education and prevention, including vaccines. Prevention and education are vital, but what about the 22 million people already infected with HIV? Can we simply allow them to die when medicines are already available that could prolong their lives? The Clinton/Gore administration is ignoring an obvious strategy that could prolong tens of thousands of lives and relieve the suffering and pain caused by opportunistic infections. The administration should actively support attempts of various countries to begin producing inexpensive life-saving AIDS drugs. Take the case of Thailand. The Thai government is poised to produce the important anti-HIV drug ddI but has faced repeated pressure by its producer and the United States Trade Representative not to do so. Although Thailand has the right within international trade rules to produce a generic version of the drug, repeated threats by the USTR have been taken seriously. Poorer countries commercial policies are significantly influenced by the US because access to the US market and US loans and investment are viewed as critical to improve national economies. Everyday MSF doctors and their local counterparts in Africa, Asia and Latin America are diagnosing opportunistic infections but are forced to tell their patients that treatment is too expensive to consider. In some cases, the infrastructure is in place to begin administering the anti-HIV cocktails that have become the standard-of-care in wealthy countries, but again high drug prices prevent these prescriptions from being written. Earlier this week Gore said that the US: “Will cooperate with our trading partners to assure that US trade policies do not hinder their efforts to respond to health crisis”. MSF calls on the US to go beyond just “not hindering their efforts”, and to actively support these trading partners and their doctors. 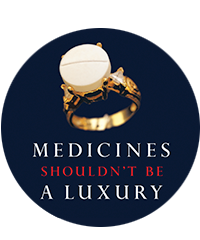 MSF is conducting an international advocacy campaign to improve access to essential medicines in poor countries.